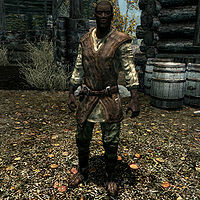 He wears a set of typical farmer’s clothes along with a pair of boots and wields a leveled dagger (up to elven quality at level 20). He carries the key to the stables, a belted tunic and a selection of lower-class items and gold. 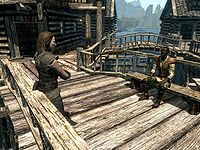 Sapphire’s reaction will differ depending on how long you have progressed in the Thieves Guild quest line; if you have yet to become a member, she will be harder to convince and you will have to either persuade, intimidate or bribe her; if you’re Guildmaster, Sapphire will openly admit her scam and will even try and cut you a deal. Naturally, Shadr’s responses will differ as well. If you failed to persuade or bribe Sapphire – or if she cut you in on the deal - he will say: "Oh. Well, thanks for trying I suppose. I'll just have to come up with the coin somehow." If you managed to clear his debt completely he will happily say: "By the Eight! You actually talked her into it? I don't know what to say. I didn't think anyone in Riften even cared what happened to me. Look, I was saving this, but I wanted you to have it. I thought I might need it if Sapphire came for me, but I don't need it anymore." Esta página foi modificada pela última vez à(s) 00h36min de 2 de maio de 2014.